Maintain transaction integrity across distributed nodes. Support high-concurrency, low latency data operations in your application. Node failover and WAN-replication ensure resiliency of your application, even in the cloud. Create a new class of applications that operate in real-time, thanks to distributed in-memory technology. Scale your applications elastically to serve expected or viral peaks in demand. As the number of microservices increases, deliver data change notifications directly to the apps that subscribe to it. Even during huge peaks in concurrent access, your users can count on predictable low latency because of the in-memory, horizontally scalable architecture of GemFire. Easily scale out horizontally to meet the most demanding peaks in usage. Scale back down again gracefully when the peaks are behind you. Keep your steady state runtime costs down. Your applications can subscribe to real-time events to react to changes immediately. GemFire’s continuous queries notify your application when new data is available, which reduces the overhead on your SQL database. No more downtime from node failures, datacenter-wide outages, or software upgrades. GemFire nodes automatically fail-over in the event of a node-level outage, while its highly efficient WAN replication protocol enables multi-datacenter deployment for business continuity. Eliminate data loss with GemFire’s in-memory data replication and a shared-nothing persistence architecture, providing unmatched data resiliency. 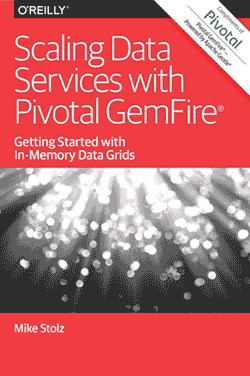 Available as a service on Pivotal Cloud Foundry, enable on-demand access to GemFire's high performance, highly available, event-driven data grid on the leading cloud-native application platform. GemFire is flexible and can be deployed in any of these configurations. Still waiting for that page to load? Every. Second. Counts. GemFire can serve as a caching layer, providing fast recall of frequently accessed data across multiple clouds or data centers. This allows for continuous data accessibility with very low-latency, supporting sophisticated caching solutions ranging from web session caching to mainframe offloading. Online shopping. Connected devices. Securities trading. These types of transactional applications demand extremely high-performance data management to process thousands of parallel transactions. In these cases, an in-memory data grid that supports high data consistency is a must to provide real-time responses. Credit card fraud. Risk calculation. Industrial fleet tracking. GemFire’s powerful in-memory data grid can manage terabytes of data in-memory and push notifications to track and respond to mission critical processes in real-time. This fast, continuous querying capability allows systems to quickly and easily access large amounts of incoming data and take action.